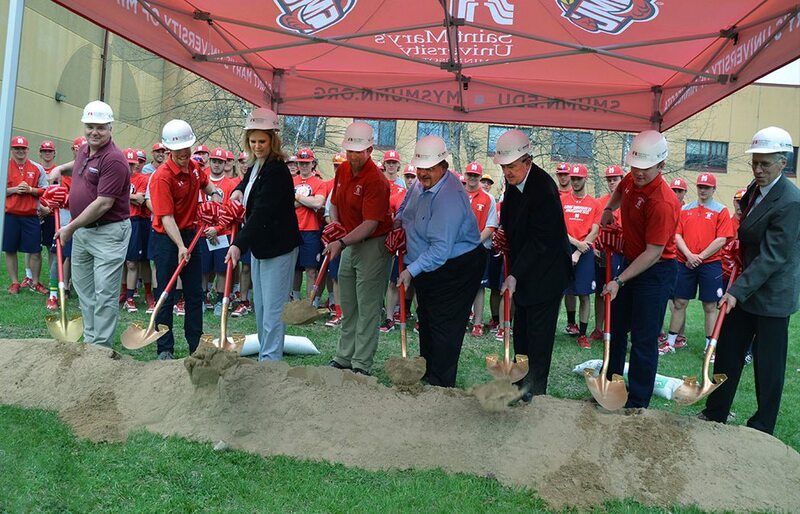 Saint Mary’s University broke ground May 1 on a new $704,000 baseball clubhouse, and excitement was in full swing. The project was made possible through the generosity of a lead gift from Marc Weisenburger ’75, and more than 50 other young alumni have stepped up to bat to join Weisenburger in this dream by sponsoring lockers at $2,000 or more. Winecke said that the clubhouse, which will be referred to as Pudge’s Place — in recognition of Weisenburger’s nickname during his playing days — is proof of what a university can accomplish when groups of thankful and generous benefactors give back to their alma mater in thanks for the experiences they received as athletes. Weisenburger said he was inspired by the generosity shown by Saint Mary’s alumni and friends while building the Science and Learning Center. “I wondered what people could accomplish when they could join together for a cause they believe in … something near and dear to my heart, the baseball program at Saint Mary’s and (legendary coach) Max Molock,” he said. “Max Molock trained athletes to compete in baseball and we had a modicum of success, but most importantly he trained us how to be better as people and leaders,” he added. Winecke said that when Weisenburger, who has supported the baseball program at Saint Mary’s for 10 years, started talking about his dreams for the clubhouse, he knew he wanted to create something that would help the Cardinal baseball team develop as players, more importantly develop strong leaders. Weisenburger said. “That’s how I have attempted to live my life and that’s what I’ve learned from game of baseball and from Max. He coached for 42 seasons before retiring in 1983. And I believe this same life mentoring approach and coaching style is has been adapted by Nick Winecke more than 30 years later.